This paper explains the application of fluorescent imaging using an activatable optical imaging probe to visualize the in vivo activity of key matrix metalloproteinases in two different experimental models of inflammation. Schwenck, J., Maier, F. C., Kneilling, M., Wiehr, S., Fuchs, K. Non-invasive In Vivo Fluorescence Optical Imaging of Inflammatory MMP Activity Using an Activatable Fluorescent Imaging Agent. J. Vis. Exp. (123), e55180, doi:10.3791/55180 (2017). This paper describes a non-invasive method for imaging matrix metalloproteinases (MMP)-activity by an activatable fluorescent probe, via in vivo fluorescence optical imaging (OI), in two different mouse models of inflammation: a rheumatoid arthritis (RA) and a contact hypersensitivity reaction (CHR) model. Light with a wavelength in the near infrared (NIR) window (650 - 950 nm) allows a deeper tissue penetration and minimal signal absorption compared to wavelengths below 650 nm. The major advantages using fluorescence OI is that it is cheap, fast and easy to implement in different animal models. Activatable fluorescent probes are optically silent in their inactivated states, but become highly fluorescent when activated by a protease. Activated MMPs lead to tissue destruction and play an important role for disease progression in delayed-type hypersensitivity reactions (DTHRs) such as RA and CHR. Furthermore, MMPs are the key proteases for cartilage and bone degradation and are induced by macrophages, fibroblasts and chondrocytes in response to pro-inflammatory cytokines. Here we use a probe that is activated by the key MMPs like MMP-2, -3, -9 and -13 and describe an imaging protocol for near infrared fluorescence OI of MMP activity in RA and control mice 6 days after disease induction as well as in mice with acute (1x challenge) and chronic (5x challenge) CHR on the right ear compared to healthy ears. Autoimmune diseases such as rheumatoid arthritis (RA) or psoriasis vulgaris are graded as delayed-type hypersensitivity reactions (DTHRs).1 RA is a common autoimmune disease characterized by erosive synovitis and joint destruction.2 Inflamed arthritic joints demonstrate infiltration and proliferation of inflammatory cells, an increased expression of pro-inflammatory cells leading to pannus formation, cartilage and bone destructions.3,4 The cleavage of extracellular matrix molecules, such as collagen by matrix metalloproteinases (MMPs), is essential for tissue conversion and angiogenesis and causes tissue destructions.5,6 Contact hypersensitivity reactions (CHR) are characterized by aggregation of neutrophils leading to an oxidative burst.7 Similar to RA, MMPs in CHR are involved in tissue conversion, cell migration and angiogenesis in order to establish chronic inflammation. To investigate RA, the glucose-6-phosphate isomerase (GPI)-serum injection mouse model was used.8 Serum from transgenic K/BxN mice containing antibodies against GPI, was injected into naïve BALB/c mice after which rheumatic inflammation began to develop within 24 h with a maximum of ankle swelling on day 6 after GPI-serum injection (see 1.1). To analyze chronic CHR, C57BL/6 mice were sensitized with trinitrochlorobenzene (TNCB) on the abdomen. The right ear was challenged up to 5 times starting 1 week after sensitization (see also 1.1 and 1.2). Noninvasive small animal OI is a technique based on the in vivo investigation of fluorescent-, chemiluminescent- and bioluminescent-signals, which are mainly used in preclinical research. The acquired semi-quantitative data gives insights into the molecular mechanisms in the organs and tissues of healthy as well as diseased experimental animal models, and enables longitudinal follow up measurements (e.g. to assess therapeutic response profiles in vivo). A big advantage of longitudinal studies is the reduction of animal numbers, as the same animals can be measured in follow up studies at several time points instead of using different mice per time point. The resolution of OI allows detailed functional imaging of organs and even smaller tissue structures in experimental animals. The use of specific excitation and emission filters with a narrow transmission spectrum, a protection against scattered light by a lightproof "dark box" and a sensitive charged-coupled device (CCD) camera, which is cooled in many devices down to -70 °C, allows highly specific and sensitive measurements of fluorescence signals. By using fluorescent agents with excitation- and emission-spectra in the near-infrared fluorescence window (650 - 950 nm), signal-to-noise ratios can be improved significantly. The near-infrared fluorescence window is characterized by a relatively low absorption of the signal by hemoglobin and water as well as a low background auto-fluorescence.9 This allows a penetration depth of up to 2 cm in the tissue of small animals. OI-probes can address a target directly (e.g. by a fluorescence labeled antibody) or can be activated in the target tissue (e.g. by proteases). Activatable OI probes are optically silent in their inactivated form due to the Förster resonance energy transfer (FRET) to a quenching moiety, which transfers the excitation energy within the molecule to another domain. If the dye is cleaved (by a protease for example) the energy is no longer transferred within the molecule and a fluorescent signal can be detected by OI. This allows the design of OI probes with high specificity for distinct biological processes and excellent signal-to-noise-ratios. The following protocol explains in detail the preparation of the animals, the OI measurements using an Activatable OI probe to image MMP-2, -3, -9 and -13 activity in vivo and two experimental models of inflammation (RA, CHR). All procedures described in this paper, followed the guidelines and international standards of the care and use of laboratory animals and were approved by the local Animal Welfare and Ethics Committee of the Country Commission Tuebingen, Germany. 8 - 12 weeks old BALB/c and C57BL/6 mice were kept on a 12 h:12 h light:dark cycle and were housed in IVCs and standardized environmental conditions at 22 ± 1 °C in groups of 2 - 5 with water and food access ad libitum. Dilute the OI dye for near infrared fluorescence imaging according to the respective data sheet directly before injection. The activatable OI dye (commercial probe with an excitation at 680 nm) to measure MMPs in vivo is ready to use at a concentration of 20 nmol in 1.5 mL 1x PBS. Gently shake or vortex the solution before use. OI dye can be stored at 2 - 8 °C for up to 6 months when protected from light. For intravenous (i.v.) injections prepare a venous catheter. Use a 20 U (0.5 mL) insulin syringe filled with 0.9% saline solution (containing 10 injection units of heparin in 50 mL), and a 30-gauge needle attached to a polyethylene catheter. Inject the recommended dose of 2 nmol per mouse of the OI dye. Dilute 100 µL of serum (gained from K/BxN mice10) containing antibodies (AB) against glucose-6-phosphate isomerase (GPI) 1:1 with 1x PBS (200 µL) to induce RA. Store the diluted serum at -80 °C. Detailed procedures for induction of RA are described by Monach et al.8. To induce RA, lift each mouse gently by its tail and inject 200 µL of the diluted serum intraperitoneal (i.p.) on day 0 of the experiment. After the injection place the mouse directly back into its cage. Optionally, measure the ankle diameters of each ankle, before AB injections and define an "arthritic score" (Figure 1A). Continue measurement of ankle swelling daily until day 6 after GPI-serum using a mechanical measuring device (micrometer). Inject the activatable OI dye (step 1.1 - 1.2), to measure in vivo MMP activity i.v. into the tail vein of RA mice on day 5 after GPI-serum injection and into the tail vein of control mice. Perform optical imaging experiments 24 h after tail vein injection. For sensitization of C57BL/6 mice, prepare a 5% TNCB solution dissolved in a 4:1 mixture of acetone/oil. Anaesthetize C57BL/6 mice using 1.5% isoflurane vaporized in 100% oxygen (1.5 L/min). Once the mice are anesthetized, place it in a self-made nose cone (a cut 5 mL polyethylene syringe, connected to the 1.5 vol% isoflurane tube) and maintain anesthesia. Apply vet eye ointment on anesthetized animals to prevent dryness of the eyes while anesthetized. Shave the abdomen carefully (2 x 2 cm) using a small animal hair trimmer. Avoid injuring the skin, as this can lead to unspecific fluorescent signals within the animal and can influence the results of the study. Apply 80 µL of the 5% TNCB solution slowly at the shaved abdomen area using a 100 µL pipette to sensitize the animal. Place the mouse gently back into its cage taking care to ensure that the mouse’s eyes do not come in contact with the bedding to avoid corneal injury and avoid low body temperatures during recovery phase. Start with the 1st challenge on both sides of the right ear with 20 µL of 1% TNCB solution using a 100 µL pipette and repeat the challenge every second day up to five times (day 15 after sensitization) to elicit CHR (Figure 1B). Measure ear thickness daily, using a micrometer measuring device. 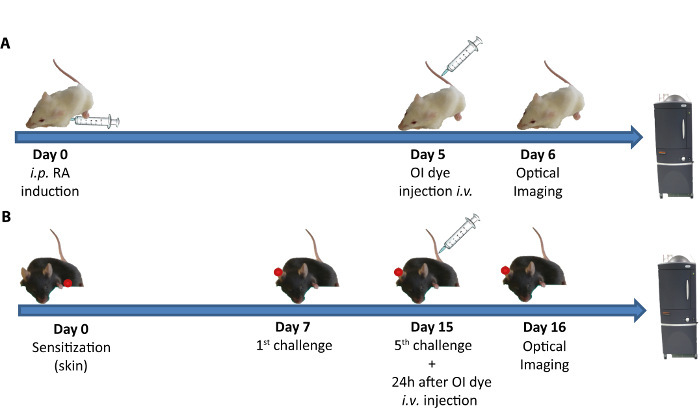 Inject the activatable OI dye (a commercial probe with excitation at 680 nm) (step 1.1-1.2) to measure MMP activity in vivo in CHR mice 12 h after the challenge. Perform optical imaging experiments 24 h post tail vein injection (i.v.). Switch mouse chow (at least 3 days before imaging) to low or non-fluorescence chow (e.g., manganese free) to avoid the interference of auto-fluorescence (around 700 nm) with the fluorescence signal of the used OI agents. Place the animal into an anesthesia box and anesthetize using 1.5 vol% isoflurane vaporized with oxygen (1.5 L/min) (oxygen can be replaced by air but needs to be standardized within one experiment). When the mouse is visibly anesthetized, place it in a self-made nose cone (build by a cut 5 mL polyethylene syringe, connected to the 1.5 vol% isoflurane tube) and maintain anesthesia. Shave the animal carefully on the target site (2 cm x 2 cm) using a small animal hair trimmer. Avoid injuring the skin, as this can lead to unspecific fluorescent signals within the animal and can influence the results of the study. NOTE: Hairs can absorb the fluorescence signal during OI (dependent on the mouse strain, more or less absorption is observed) depending on the region of interest (ROI). For i.v. injection, place the tail of the mouse in warmed water, to induce vasodilation, gently cleanse the skin at the injection site with alcohol, and start by placing the catheter at the distal site of the tail. Place the "cut" edge of the needle in, at an angle of 20° into the tail vein and test the correct placing of the catheter by re-suspending the syringe. If the catheter is placed correctly, replace the syringe and inject the OI probe (2 nmol). After injection, replace the syringe and inject 25 µL of 0.9% saline solution to fully clear the dead volume of the polyethylene tube. NOTE: The tissue half-life time of the used OI dye (a commercial probe with excitation at 680 nm) for measuring MMP activity in vivo is 72 h. To ensure a complete clearance, a re-injection of the dye is not recommended earlier than 7 days after a prior injection. Place a black plastic or paper sheet in the black box of the OI-scanner in the center of the field of view (FOV). Set up a measuring protocol and choose the right wavelength (excitation: 680 ± 10 nm and emission: 700 ± 10 nm) and imaging parameters. NOTE: In some OI systems, the setup for several imaging dyes is pre-defined. To choose the correct protocol for fluorescence imaging, open the imaging software (provided by the manufacturer) and initialize the system. Most CCD cameras need to cool down to their working temperature, and this can take 10 minutes. For reliable results, wait until the system is ready. Observe the in vivo imaging system acquisition control panel pop up and each filter pair selected will represent one image in the sequence. In this case, acquire one image with the filter pairs for the commercial dye with and an excitation and emission wavelength of 680 ± 10 nm and 700 ± 10 nm, respectively, and start the measurement (Press "Acquire sequence"). For more detailed instructions, please see the manual of the manufacturer. Label the images appropriately and save the information in the "Edit Image Labels" window, which will pop up following the "Acquire sequence". Take a baseline scan of each animal before the injection of the OI dye, or use naïve control animals to differentiate the background signal. h after the tail vein injection of the OI dye, place the animals in the center of the FOV, in a position to measure the highest signal in the OI system, and start the measurements. NOTE: Important: Hypothermia can significantly influence the distribution of imaging agents. Make sure that the stage is heated up to 37 °C to avoid hypothermia of the animal. Imaging can be performed simultaneously with animals in groups of 1 to 5 mice. Choose the size of the FOV depending on the number of animals to measure at the same time. You can take a bright field image to check whether each mouse is visible. NOTE: Perform data analysis using the image software following manufacturer's protocol. For measurements of RA, use the calibrated unit of the photon emission as shown in Figure 2, whereas chronic CHSR are pictured as signal intensity in percent (efficiency). To draw ROIs manually, use the tool plate. For the analysis of the RA images use a standardized circle, placed around the highest signal in all ankles and paws of each animal. To analyze the CHSR, place the ROIs around the whole right and left ear according to the bright field image. To measure photon emission or signal intensity values in the specific drawn ROI, press "measure". The system will provide values in the drawn ROI for descriptive statistical analysis. To induce rheumatoid arthritis (RA) in naïve BALB/c mice, animals were injected i.p. with auto-antibodies (1:1 dilution with 1x PBS) against GPI on day 0. The maximum inflammation (ankle swelling) in this GPI-serum induced RA model is on day 6 post injection11. Therefore, 2 nmol of the activatable OI dye was prepared and injected i.v. in the tail vein of arthritic mice and healthy control animals on day 5. 24 h after injection (day 6), mice were anesthetized and imaged as described in in section 3 (Figure 1A). To induce CHR, C57BL/6 mice were sensitized with 5% TNCB on day 0 at the shaved abdomen. On day 7 post sensitization the 1st challenge on the right ear using 1% TNCB started. Up to five challenges (day 15) were performed to induce chronic inflammation.7 12 h after the last challenge, 20 nmol of the OI dye was injected i.v. On day 15, 24 h post injection, OI was performed as described above (Figure 1B). Figure 2 displays a clearly enhanced fluorescence signal in the hind paws, ankles and front paws of the RA mouse on day 6 after disease induction, compared to control ankles (Figure 2A). Biodistribution analysis of the MMP activity in organs of RA mice and healthy mice exhibited a strongly enhanced signal in the hind paws, ankles and fore paws exclusively in the joints of RA mice. Interestingly, we determined an enhanced MMP signal in both kidneys of all measured RA mice, when compared to the kidneys of healthy control mice (Figure 2A; right). Moreover, we measured an enhanced MMP signal in the liver and intestine regardless of whether mice suffer from RA. No differences between RA and healthy mice were found in the pancreas, lung, spleen and heart. During chronic CHR (five TNCB challenges at the right ear), we measured highly increased MMP activity on the right inflamed ear compared to the healthy left control ear (Figure 2B). Thus, our data is indicating a major role of MMP activity during disease progression in both inflammatory diseases models. Toolsets for Bioluminescence and Fluorescence allow the quantification of, for example pmol of fluorochrome or the number of cells which express fluorescence. Data can be displayed in 1. Counts: displays an uncalibrated measurement of the photon incident on the camera, 2. Radiance (photons): indicates a calibrated measurement of the photon emission in "photons/second/cm2/steradian", which is recommended for luminescence imaging or 3. Radiant Efficiency (fluorescence): shows fluorescence emission radiance per incident excitation power, recommended for fluorescence measurements. A big advantage of working with radiance units while analyzing OI images is, that camera settings can be changed during one experiment, and this has no impact on the images itself or the measured ROI data, which further allows comparing images from different IVIS systems. The region of interest (ROI) indicates the specific area of interest from the user in an optical image. The toolbar enables to draw 3 different ROIs: measurement (measures the signal intensity in the ROI of the image), average background (measures the average signal intensity in the user defined area for the background), or subject ROI (identifies a subject animal in an image). If the subject displays a high unspecific background signal itself, obtain a background-corrected ROI measurement by subtracting the background signal (ROI) from the target ROI. Set the image minimum close to zero to determine the auto fluorescence or naturally occurring background luminescence in your image. Link the image to a self-defined (user specific) background image (ROI) which were measured primarily to the measured specific image. Semi-quantitative analyses of the images were performed by drawing standardized regions of interest (ROIs) in both arthritic and control ankles, as well as in inflamed and healthy ears using Living Image software. Only descriptive statistical analyses were performed on in vivo data in this manuscript, due to insufficient number of animals. Analysis of the signal intensity of arthritic and healthy ankles or paws showed a 7-fold enhanced MMP signal intensity in arthritic, compared to control ankles. A 3-fold higher MMP signal intensity was detected in the front paws of arthritic mice compared to that of the healthy animals (Figure 3A). Analysis of ears with acute and chronic CHR compared to the left unchallenged control ear showed a significantly increased MMP signal even after the 1st challenge, which further increased after the 3rd and remained at the same level until the 5th challenge (Figure 3B). As a consequence of contamination with the contact allergen on the left ear due to scratching of the mice, we determined a slightly increased MMP signal in the left (not TNCB challenged) control ear. The results indicate an important role of MMPs, evinced by a highly increased fluorescence signal during GPI-arthritis and chronic inflammation, as measured by OI. Figure 1: RA and CHR Model, Time Course of Disease Induction and Time Points for OI. (A) Time course of RA induction in BALB/c mice (B) and chronic CHR induction in C57BL/6 mice. Overview of the respective in vivo imaging time point and associated injection time points of the OI dye for measuring MMP activity in both models. Please click here to view a larger version of this figure. Figure 2: MMP OI in RA, CHR and Control Animals. 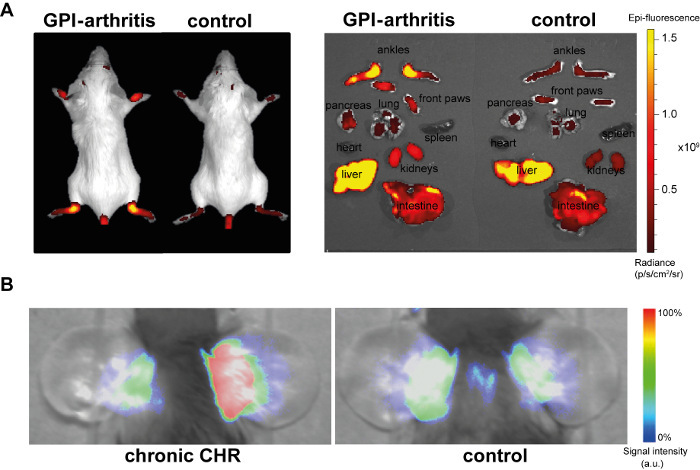 (A) Representative results of the measured MMP activity in an arthritic mouse 6 days after GPI-arthritis induction and a healthy control mouse (left side). 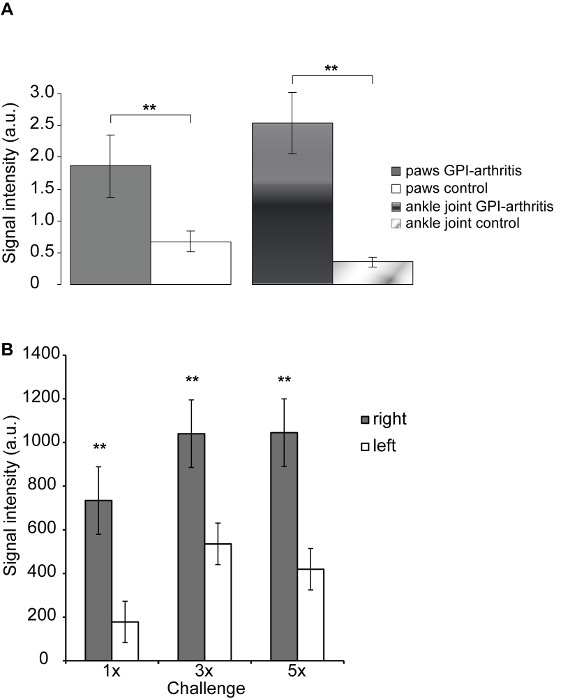 Significantly higher signal (Radiance (p/s/cm2/sr)) intensity was observed in the arthritic compared to the healthy mouse. The image on the right displays the MMP activity in the hind paws and includes the ankles, fore paws, pancreas, lung, spleen, heart, kidneys, liver and intestine of a sacrificed GPI-arthritis mouse after OI dye injection. OI uncovered a high signal in the fore paws, ankles and hind paws of RA mice and the liver and intestine regardless of whether the mice were injected with GPI serum (RA mice) or control serum (healthy control mice). (B) MMP fluorescence signal in ears with chronic CHR (left) and control animals (right). The inflamed right ear (challenged 5 times) displays a highly enhanced signal compared to control ears. Please click here to view a larger version of this figure. Figure 3: Semi Quantitative Analysis of Inflamed and Healthy Ankles and Ear Tissue Using OI. (A) Semi-quantitative analysis of the fluorescence signal in RA and healthy animals in the front paws and ankle joints. Arthritic front paws and ankle joints display a significantly (**p < 0.05) (n = 3) higher MMP signal compared to healthy ankle joints and front paws. The data is presented as the mean ± SD. (B) Semi-quantitative analysis of the left and right (challenged) ears after the 1st, 3rd and 5th challenge. MMP signal is increased significantly from the first to the 5th challenge and already showed a maximum signal intensity in the right challenged ear after the 3rd challenge (**p < 0.05) (n = 3) (Control ears are partly contaminated with TNCB due to the mice scratching. This produced an enhanced signal which was not significant). The data is presented as the mean ± SEM. The 2-tailed Student's t-test was used to analyze differences between inflammation (GPI-arthritic ankles, right treated ears) and control (control ankles, left untreated ears) for both models. Please click here to view a larger version of this figure. OI is a very useful, fast and inexpensive tool for non-invasive in vivo molecular imaging in preclinical research. A particular strength of OI is the capability to monitor highly dynamic processes like inflammatory responses. Moreover, OI allows one to follow the course of a disease for an extended period of time, ranging from days to weeks. Effects of anesthesia should not be underestimated in in vivo imaging. While specific effects of anesthesia on OI results are not well characterized, our group has shown in several studies the influence of anesthesia on PET imaging results.13,14,15 For example, Fuchs et al. analyzed blood parameters, such as pCO2, pH and lactate before and after PET scans using different breathing and anesthesia protocols. It was shown that, significant changes in pCO2 and lactate levels in anesthetized compared to conscious oxygen or air breathing mice led to significant changes in PET results.14 They conclude that this effect is mainly caused by oxygen breathing and subsequent to respiratory acidosis in animals, leading to the different results in the PET imaging. Standardization of anesthesia parameters, like O2-concentrations and doses of anesthetic drugs, as well as prevention of hypothermia help to avoid systematic failures. Of course, OI is limited by physical properties e.g. light scattering, tissue auto-fluorescence and light attenuation9. Several groups are addressing these problems by combining the macroscopic results of OI with other techniques like in vivo fluorescence microscopy or flow cytometry. Labeling of MMP inhibitors with radioactive isotopes for single-photon emission computed tomography (SPECT) or PET imaging was used to study MMP expression in atherosclerosis26 and cancer27. In a recent study a fluorescence-labeled MMP inhibitor was compared to an MMP-activatable probe.28 The fluorescently-labeled MMP inhibitor showed a lower signal to noise ratio compared to an activatable probe but required a shorter uptake time. In conclusion, OI represents a fast and efficient method for preclinical research, which is capable of uncovering new mechanisms of diseases in vivo, characterizing novel molecular targets, as well as monitoring therapeutic effects. Nevertheless, a subsequent validation process with more quantitative techniques like PET might be required. We thank Daniel Bukala, Natalie Altmeyer and Funda Cay for excellent technical support. We thank Jonathan Cotton, Greg Bowden and Paul Soubiran for editing the manuscript. This work was supported by the Werner Siemens-Foundation and the Medical Faculty of the Eberhard Karls University Tübingen (‘‘Promotionskolleg’’) and by the DFG through the CRC 156 (project C3). Veale, D. J., Ritchlin, C., FitzGerald, O. Immunopathology of psoriasis and psoriatic arthritis. Ann Rheum Dis. 64, 26 (2005). Harris, E. D. Rheumatoid arthritis. Pathophysiology and implications for therapy. N Engl J Med. 322, (18), 1277-1289 (1990). Lee, D. M., Weinblatt, M. E. Rheumatoid arthritis. Lancet. 358, (9285), 903-911 (2001). Firestein, G. S. Immunologic mechanisms in the pathogenesis of rheumatoid arthritis. J Clin Rheumatol. 11, S39-S44 (2005). Pap, T., et al. Differential expression pattern of membrane-type matrix metalloproteinases in rheumatoid arthritis. Arthritis Rheum. 43, (6), 1226-1232 (2000). Firestein, G. S., Paine, M. M. Stromelysin and tissue inhibitor of metalloproteinases gene expression in rheumatoid arthritis synovium. Am J Pathol. 140, (6), 1309-1314 (1992). Schwenck, J., et al. In vivo optical imaging of matrix metalloproteinase activity detects acute and chronic contact hypersensitivity reactions and enables monitoring of the antiinflammatory effects of N-acetylcysteine. Mol Imaging. 13, (2014). Monach, P. A., Mathis, D., Benoist, C. The K/BxN arthritis model. Curr Protoc Immunol. 15, 22 (2008). Zelmer, A., Ward, T. H. Noninvasive fluorescence imaging of small animals. J Microsc. 252, (1), 8-15 (2013). Kouskoff, V., et al. Organ-specific disease provoked by systemic autoimmunity. Cell. 87, (5), 811-822 (1996). Fuchs, K., et al. In vivo imaging of cell proliferation enables the detection of the extent of experimental rheumatoid arthritis by 3'-deoxy-3'-18f-fluorothymidine and small-animal PET. J Nucl Med. 54, (1), 151-158 (2013). Schwenck, J., et al. Fluorescence and Cerenkov luminescence imaging. Applications in small animal research. Nuklearmedizin. 55, (2), 63-70 (2016). Mahling, M., et al. A Comparative pO2 Probe and [18F]-Fluoro-Azomycinarabino-Furanoside ([18F]FAZA) PET Study Reveals Anesthesia-Induced Impairment of Oxygenation and Perfusion in Tumor and Muscle. PLoS One. 10, (4), 0124665 (2015). Fuchs, K., et al. Oxygen breathing affects 3'-deoxy-3'-18F-fluorothymidine uptake in mouse models of arthritis and cancer. J Nucl Med. 53, (5), 823-830 (2012). Fuchs, K., et al. Impact of anesthetics on 3'-[18F]fluoro-3'-deoxythymidine ([18F]FLT) uptake in animal models of cancer and inflammation. Mol Imaging. 12, (5), 277-287 (2013). Liu, N., Shang, J., Tian, F., Nishi, H., Abe, K. In vivo optical imaging for evaluating the efficacy of edaravone after transient cerebral ischemia in mice. Brain Res. 1397, 66-75 (2011). Sheth, R. A., Maricevich, M., Mahmood, U. In vivo optical molecular imaging of matrix metalloproteinase activity in abdominal aortic aneurysms correlates with treatment effects on growth rate. Atherosclerosis. 212, (1), 181-187 (2010). Chen, J., et al. Near-infrared fluorescent imaging of matrix metalloproteinase activity after myocardial infarction. Circulation. 111, (14), 1800-1805 (2005). Wallis de Vries, B. M., et al. Images in cardiovascular medicine. Multispectral near-infrared fluorescence molecular imaging of matrix metalloproteinases in a human carotid plaque using a matrix-degrading metalloproteinase-sensitive activatable fluorescent probe. Circulation. 119, (20), e534-e536 (2009). Weissleder, R., Tung, C. H., Mahmood, U., Bogdanov, A. In vivo imaging of tumors with protease-activated near-infrared fluorescent probes. Nat Biotechnol. 17, (4), 375-378 (1999). Cortez-Retamozo, V., et al. Real-time assessment of inflammation and treatment response in a mouse model of allergic airway inflammation. J Clin Invest. 118, (12), 4058-4066 (2008). McIntyre, J. O., et al. Development of a novel fluorogenic proteolytic beacon for in vivo detection and imaging of tumour-associated matrix metalloproteinase-7 activity. Biochem J. 377, 617-628 (2004). Scherer, R. L., VanSaun, M. N., McIntyre, J. O., Matrisian, L. M. Optical imaging of matrix metalloproteinase-7 activity in vivo using a proteolytic nanobeacon). Mol Imaging. 7, (3), 118-131 (2008). Olson, E. S., et al. In vivo characterization of activatable cell penetrating peptides for targeting protease activity in cancer. Integr Biol (Camb. 1, (5-6), 382-393 (2009). Duijnhoven, S. M., Robillard, M. S., Nicolay, K., Grull, H. Tumor targeting of MMP-2/9 activatable cell-penetrating imaging probes is caused by tumor-independent activation). J Nucl Med. 52, (2), 279-286 (2011). Schafers, M., Schober, O., Hermann, S. Matrix-metalloproteinases as imaging targets for inflammatory activity in atherosclerotic plaques. J Nucl Med. 51, (5), 663-666 (2010). Wagner, S., et al. A new 18F-labelled derivative of the MMP inhibitor CGS 27023A for PET: radiosynthesis and initial small-animal PET studies. Appl Radiat Isot. 67, (4), 606-610 (2009). Waschkau, B., Faust, A., Schafers, M., Bremer, C. Performance of a new fluorescence-labeled MMP inhibitor to image tumor MMP activity in vivo in comparison to an MMP-activatable probe. Contrast Media Mol Imaging. 8, (1), 1-11 (2013). Vogl, T., et al. Alarmin S100A8/S100A9 as a biomarker for molecular imaging of local inflammatory activity. Nat Commun. 5, 4593 (2014).